We’d love your help. Let us know what’s wrong with this preview of Hot Lights, Cold Steel by Michael J. Collins. When Michael Collins decides to become a surgeon, he is totally unprepared for the chaotic life of a resident at a major hospital. A natural overachiever, Collins' success, in college and medical school led to a surgical residency at one of the most respected medical centers in the world, the famed Mayo Clinic. But compared to his fellow residents Collins feels inadequate When Michael Collins decides to become a surgeon, he is totally unprepared for the chaotic life of a resident at a major hospital. A natural overachiever, Collins' success, in college and medical school led to a surgical residency at one of the most respected medical centers in the world, the famed Mayo Clinic. But compared to his fellow residents Collins feels inadequate and unprepared. All too soon, the euphoria of beginning his career as an orthopedic resident gives way to the feeling he is a counterfeit, an imposter who has infiltrated a society of brilliant surgeons. To ask other readers questions about Hot Lights, Cold Steel, please sign up. I think the reason I love medical memoirs, and specifically those dealing with the first few years of a newly graduated medical student is that their first year as interns are as relatable as they will ever be to us non-medical folks. You can have all the book learning you want but the first time you see a trauma case you are going to react the same way I would – freeze and panic. What makes this one noteworthy is that Mike Collins is an orthopaedic resident, paying his dues over 4 years to go from junior to senior resident. Late nights, no sleep, hospital politics, a wife that keeps on getting pregnant (at least he had time for that!) and moonlighting to supplement the low pay during these years. As with other memoirs there are moments of doubt whether medical intervention causes more harm than good for a patient. There are some touching as well as funny moments and the writing is seamless and engaging. My favourite among these memoris is still This Is Going To Hurt It had me howling with laughter and I completely understand why that particular Dr chose to show the funny and not the hopelessness that this job can sometimes bring out. Having a baby, yearly saint Patti (wife) and the many sacrifices termed “moonlighting” to support his family of twelve children are surgical scalpel honey. Sacrifices made by Dr. Michael J. Collins do rouse emotion in the reader and we realize great suffering produces humility, empathy and bonding---and in this case a truly stellar surgeon. This was one of my favorite “doctor” books. Dr. Collins is an amazing author who brings truth and humor to his life as a resident. In stark contrast to “Intern Blues”, Dr. Collins isn’t caught whining; rather, he understands his job is tough, the hours long, and the decisions difficult with a sense of journey. That is, he engrosses himself in his life and enjoys the ride. You really can feel his emotions when he succeeds, fails, is uncertain. You grow in compassion and respect for his supportive This was one of my favorite “doctor” books. Dr. Collins is an amazing author who brings truth and humor to his life as a resident. In stark contrast to “Intern Blues”, Dr. Collins isn’t caught whining; rather, he understands his job is tough, the hours long, and the decisions difficult with a sense of journey. That is, he engrosses himself in his life and enjoys the ride. You really can feel his emotions when he succeeds, fails, is uncertain. You grow in compassion and respect for his supportive wife. He really lets you in to his life. It has given me insight into what I have to look forward to as well. "I was a counterfeit, an impostor who had infiltrated this society of brilliant surgeons. [...] I would have thrown myself on the floor and asked them to shoot me and put me out of my misery." When I read these lines, I knew that this book was the real thing. There's something in Collins' self-deprecation and love of his work that reminds me of James Herriot, but the humour of "Hot Lights, Cold Steel" is starker, though no less funny. The laughter is there, of course, but it sounds more like a m "I was a counterfeit, an impostor who had infiltrated this society of brilliant surgeons. [...] I would have thrown myself on the floor and asked them to shoot me and put me out of my misery." When I read these lines, I knew that this book was the real thing. There's something in Collins' self-deprecation and love of his work that reminds me of James Herriot, but the humour of "Hot Lights, Cold Steel" is starker, though no less funny. The laughter is there, of course, but it sounds more like a man joking at the stake than in front of a fireplace. I wonder if the author has finally gotten some sleep since he finished his residency - then there might be hope for the rest of us! Fantastic account of a surgeons years in Residency. Learning the ins and outs, trying not to make mistakes, learning to accept them and move on if he does. This book was hilarious at times, the author is very funny. I even learned a thing or two about medical jargon. Found this while I was browsing a library that had a display of medical-themed books. I had to laugh when I realized I'd read almost half of them. I have a thing for this kind of book. Of the dozen or so books like this that I've read, Atul Gawande's 4 books definitely rank near the top. I like his writing so much, I actually approached this book with serious skepticism - no way I can like any other book as much as Gawande's right? But Michael Collins did not disappoint. This book isn't nearly a Found this while I was browsing a library that had a display of medical-themed books. I had to laugh when I realized I'd read almost half of them. I have a thing for this kind of book. Of the dozen or so books like this that I've read, Atul Gawande's 4 books definitely rank near the top. I like his writing so much, I actually approached this book with serious skepticism - no way I can like any other book as much as Gawande's right? But Michael Collins did not disappoint. This book isn't nearly as emotionally gripping as, say, Being Mortal: Medicine and What Matters in the End by Gawande, but it is just so fun to read. The accounts of tricky surgeries and tough decisions is balanced by pretty hilarious anecdotes of his residency buddies and his saintly wife. In my continuing obsession with medical student/doctor memoirs (begun last spring with Atul Gawande's wonderful books) comes this memoir about a doctor who used to be a construction worker. Collins only started medical school in his mid-twenties, and this book is primarily a story about his four years of residency as an aspiring orthopedic surgeon at the Mayo Clinic. This book was different from Gawandes' (and probably most other medically-themed memoirs) primarily in its tone, because Collins is In my continuing obsession with medical student/doctor memoirs (begun last spring with Atul Gawande's wonderful books) comes this memoir about a doctor who used to be a construction worker. Collins only started medical school in his mid-twenties, and this book is primarily a story about his four years of residency as an aspiring orthopedic surgeon at the Mayo Clinic. This is a book about a resdient at the Mayo Clinic in Orthopedics. It's about his struggles and his own doubts about why he was picked to get a residency in one of the top programs in the nation! So far, this book is proving incredibly interesting - although I must admit his residency experience appears to have been a LOT more demanding than mine! Despite the sleepless nights and such - there is something to be said for the insanity and friendships that bloom in such a time! Some of my best frien This is a book about a resdient at the Mayo Clinic in Orthopedics. It's about his struggles and his own doubts about why he was picked to get a residency in one of the top programs in the nation! So far, this book is proving incredibly interesting - although I must admit his residency experience appears to have been a LOT more demanding than mine! Despite the sleepless nights and such - there is something to be said for the insanity and friendships that bloom in such a time! Some of my best friends are those that I made during my residency!!! I will admit that I viewed my residency as something to "just get through." In reality - it was one of the best times in my life! The end of the book is so true - there's something in you at the end of various chapters in life that demand acknowlegment. Some closure if you will. This book helped me remember the absurd, demanding, but fun times I've had and hopefully have yet to come in my professional life. One of the central themes of this book is quite simple: surgery is exhausting. The author's story explains how he goes through a grueling four-year orthopedic surgery residency at the Mayo Clinic. 1) The fastidious and rigorous nature of surgery is clearly exemplified. I tried watching a few episodes of Gray's Anatomy in the past and couldn't make it through a couple of episodes. There are no late night escapades and fancy wine-and-dine moments in this book One of the central themes of this book is quite simple: surgery is exhausting. The author's story explains how he goes through a grueling four-year orthopedic surgery residency at the Mayo Clinic. 1) The fastidious and rigorous nature of surgery is clearly exemplified. I tried watching a few episodes of Gray's Anatomy in the past and couldn't make it through a couple of episodes. There are no late night escapades and fancy wine-and-dine moments in this book. There is just the next day (or night if you're on call). The author makes $2.50 an hour and works 36 hour shifts, often back to back. He is so tired, he falls asleep while driving and can barely pay attention to his own family during one of his more tiring rotations. Obviously there is no time or energy for scandalous love making in the on-call room for this fellow. 2) The book shows the progression of a man who was extremely excited by a total knee replacement and loved orthopedic surgery to a veteran chief resident whose love for the field is still there (albeit much more subdued). In this journey, we see someone who learns to value his workmanship, lose and regain the humanity of his practice, and learn to value his family above all. 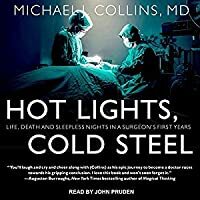 Told through flashback, Michael J. Collins’ Hot Lights, Cold Steel is a sleep-deprived romp through four years of orthopedic residency at the Mayo Clinic. Although published more than 20 years after his days as a resident, readers will feel as though they are along for the ride with Collins and his colleagues. He walks us through his thought process as he confronts his first views of surgery and many sleepless nights moonlighting in a rural emergency room. While the book doesn’t give great insig Told through flashback, Michael J. Collins’ Hot Lights, Cold Steel is a sleep-deprived romp through four years of orthopedic residency at the Mayo Clinic. Although published more than 20 years after his days as a resident, readers will feel as though they are along for the ride with Collins and his colleagues. He walks us through his thought process as he confronts his first views of surgery and many sleepless nights moonlighting in a rural emergency room. While the book doesn’t give great insight into the practice of orthopedic medicine, it does have enough descriptive scenes to make the squeamish blanch. But the focus is really on Collins’ journey and how he overcomes his feelings of inadequacy. Devouring textbooks and journals with Stedman’s Medical Dictionary by his side, Collins pushes to acquire the knowledge and experience needed to rise to chief resident. His story gives readers an appreciation for the financial and emotional sacrifices that doctors (and their families) make during training. It also might have some readers asking their surgeons when they last slept. This entertaining read is recommended for public, academic and medical libraries. "I'm not god" is quite possibly the most irritating pseudohumblebrag anyone could ever come up with. There are some great moments, but most of what's in here are formulated and stale. The sort of thing way too common in doctor autobiographies - more about what the writers think the readers want to hear. Some reflective moments were great. Vaguely disturbed by how casual Collins is about reguarly breaking confidentiality to entertain the wife (but I guess in their culture it counts as "good famil "I'm not god" is quite possibly the most irritating pseudohumblebrag anyone could ever come up with. There are some great moments, but most of what's in here are formulated and stale. The sort of thing way too common in doctor autobiographies - more about what the writers think the readers want to hear. Some reflective moments were great. Vaguely disturbed by how casual Collins is about reguarly breaking confidentiality to entertain the wife (but I guess in their culture it counts as "good family man" moral point or something). At least one chapter was creepy beyond any doubt. Mostly insincere vibe. This Orthopedic surgeon is a very good storyteller! Good sense of humor - his wife needs to write a book about surviving life with all those kids without her husband around! It is biography of his life and a collection of very touching/humorous/nerve wracking stories on his journey of becoming and practicing as an M.D. I think of my grandfather, leaving his wife to raise six kids without him around, and all the stories he used to tell me of late night calls, the heartbreak and the thrills of being This Orthopedic surgeon is a very good storyteller! Good sense of humor - his wife needs to write a book about surviving life with all those kids without her husband around! Parts of the medical side to this book went over my head. Obviously. I don't work in the field and I'd prefer to stay away. But I (per usual) appreciate people coming into their own and learning to be better. I don't know if I would qualify Collins as an underdog. However, similar aspects apply in the fact that he felt that he came into his residency blind. The book is infused with humor while Collins reflects back on his younger self. Perhaps a needed touch considering the material. Overall, a Parts of the medical side to this book went over my head. Obviously. I don't work in the field and I'd prefer to stay away. A very entertaining book about a man's surgical residency. It's informative if you're interested in medicine yourself (as is the case for me), but deserves to be read on the merit of it's entertainment value alone. At times hilarious, touching, and tragic. It's a rather short memoir, but you find yourself really caring about the author and his story by the end. Read it all in a few days and didn't want it to end. This book was even better than expected, interlaced with dark humor. I turned the tv off and read the book all evening! A very likable group of would-be surgeons, indeed! Really interesting subject matter - and I love the descriptions of the surgeries and various orthopaedic complications that Collins encountered. Collins has included the trials and joys of his personal life as well, which is a nice, and important, touch. There are a couple of laugh-out-loud moments thrown in too. The writing itself is fairly basic and straightforward, although it is well organised and laid-out. This makes for a worthwhile read if you are interested in This is a pretty good read. It always fascinates me when I read a biography written by a doctor, how they felt during school & residency, how they felt with their patients & how they got through the hardships of the job. When the doctor talked about how he felt during residency & how he dealt with it, It touched me in away that I felt hope that someday I will be a good doctor who actually knows what she is doing. This book follows Collins through his four-year orthopedic residency at the Mayo Clinic. Collins is an engaging story-teller; it was hard to put this book down. At times, it's laugh at loud funny, at other times incredibly sobering. Witnessing his transformation from an unsure first-year resident to a confident senior resident is remarkable. It's also very interesting because while there are a clearly a lot of protections in place to ensure that surgical residents are properly overseen, it also This book follows Collins through his four-year orthopedic residency at the Mayo Clinic. Collins is an engaging story-teller; it was hard to put this book down. At times, it's laugh at loud funny, at other times incredibly sobering. Witnessing his transformation from an unsure first-year resident to a confident senior resident is remarkable. It's also very interesting because while there are a clearly a lot of protections in place to ensure that surgical residents are properly overseen, it also raises questions on the nature of surgical training. You have to let residents cut at some point, of course, and eventually they must operate on their own, but the process is both remarkable and terrifying. Also, I know that this book was written many years after his residency, and that surgery, especially orthopedics, is a male-dominated field, but I was struck by the complete absence of any women surgeons or even doctors. The only women in the book were the wives and a couple of nurses. That is no fault of Collins; it was just the way things were. I've heard orthopedics referred to as the "old-boys club," and this really cemented that. I don't know that things have changed much in that particular surgical specialty. Collins gives us a little peek into the life of an intern during his four years of residency. He tells how the interns watch surgeries until the attending doctor thinks they are ready to do a part of the surgery and then the whole surgery. Collins and his wife, Patti are living from hand to mouth with no money. Collins moonlights for $20 an hour so the family can get by. His sleepless nights are dangerous to himself when driving and I wonder how he did in surgery without sleep. His descriptions Collins gives us a little peek into the life of an intern during his four years of residency. He tells how the interns watch surgeries until the attending doctor thinks they are ready to do a part of the surgery and then the whole surgery. Collins and his wife, Patti are living from hand to mouth with no money. Collins moonlights for $20 an hour so the family can get by. His sleepless nights are dangerous to himself when driving and I wonder how he did in surgery without sleep. His descriptions of his many junker cars is very funny. Yearly, the two have another child, four by the end of the residency. Watching Collins struggle to make enough money, the reader wonders why they would have a child a year. The connection between Collins and his wife is beautiful and inspiring. Collins makes great friends of the other interns. We see Collins learn to become a better doctor who cares about his patients and learns to understand it is not just the surgery, but also the emotional life of the patient he must care for. A great insight into the life of an orthopedic surgeon at arguably the best medical center in the world, the Mayo Clinic in Minnesota. Michael, the author and protagonist, manages to complete his time-consuming residency while moonlighting at another hospital on almost no sleep, and taking care of his family (he eventually had 12 kids). It's entertaining! I found it inspiring to read about his work ethic. However, I feel the book is filled with too much technical information. Even though it is th A great insight into the life of an orthopedic surgeon at arguably the best medical center in the world, the Mayo Clinic in Minnesota. Michael, the author and protagonist, manages to complete his time-consuming residency while moonlighting at another hospital on almost no sleep, and taking care of his family (he eventually had 12 kids). It's entertaining! I found it inspiring to read about his work ethic. However, I feel the book is filled with too much technical information. Even though it is the autobiography of a surgeon during his residency program, he occasionally goes into detailed descriptions of a surgery(not textbook AT All, this book is not meant to teach anything, but a couple of paragraphs at a time of anatomical descriptions and surgical techniques), which could be of interest to some, though I am a medical student and still found it interrupted the flow of the book. Usually the descriptions are good and can be understood by anyone. Mike Collins was born on the West Side of Chicago. 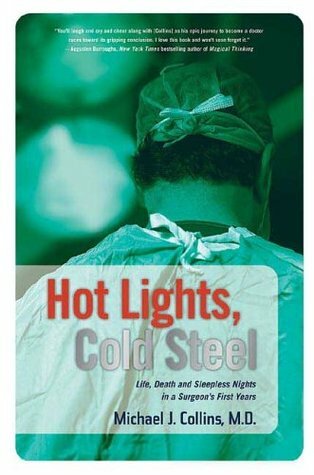 His first book, HOT LIGHTS, COLD STEEL, describes his years as a surgical resident at the Mayo Clinic. His second book, BLUE COLLAR, BLUE SCRUBS, due to be released on May 26, 2009, turns back the clock to his years as a construction worker dreaming of becoming a doctor.